Continue to read this post for a closer view of the photo and see who we have identified. Front row of group picture. 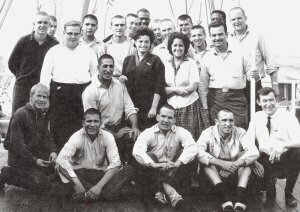 Shown from the far left is: Celerina Deck Hand Pierre-Andre Reymond, Switzerland; Pvt. Sammy Vasquez, Phoenix, Arizona; Pvt. Joe E. Hofer, Birmingham, Alabama; Pvt. Gordon Thornsberry, Russellville, Arkansas; and Celerina 2nd Steward Jean-Claude Bovier. Back rows of group photo. From the far left: Pvt. 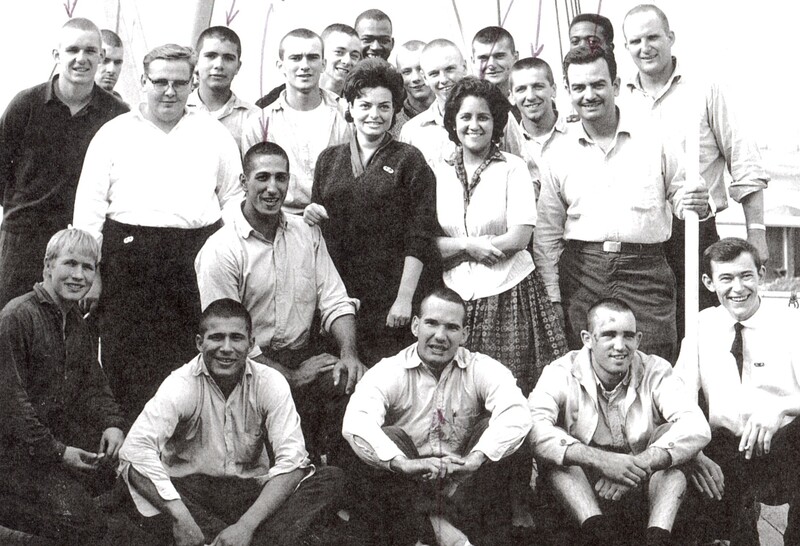 Michael Murray, Youngstown, Ohio; (in white shirt) Celerina Mess Boy Emil Kohler; (standing slightly behind Kohler) Pvt. Reynolds Mendez, Chula Vista, California; Pvt. Dominic Tuminnello, Mohnton, Pennsylvania (kneeling); an unidentified trooper; Flying Tiger Stewardess Carol Ann Gould Hansen, Lyndhurst, New Jersey; Mrs. Carmen Figueroa-Longo, Santurce, Puerto Rico; (to her immediate right) Pvt. Charles P. Keck, Gibonville, North Carolina; Capt. Juan Figueroa-Longo, MD, Santurce, Puerto Rico, and an unidentified trooper. Your help in identifying the remaining persons in the photo will be greatly appreciated. We will display the second photo in the weeks to come. This entry was posted in flight crew, new combat troopers, passengers and tagged Celerina. Bookmark the permalink. 12 Responses to Who is in the Photo? THE FIFTH PERSON IN FROM THE LEFT AT THE TOP IS PVT. THOMAS P. KOLTAK, LIVING IN PAWLEYS ISLAND, SC. that does not look at all like Carol Gould ! Private Gordon Thornsberry spoke at our Memorial Day service in Russellville, AR today about this plane crash. He is a member of the Pope County Quoram Court and was asked to be our speaker. He was pretty choked up at times. Happy 69th Birthday, D-Day; your survival & existence has given our family a sense of consolation, especially since you live just a few miles from all of us, in the Valley of the Sun. In a strange way, our beloved Carroll Mac Johnson lives, because you survived, returned home, and brought something of Uncle Mac back to us: His Good Friend Sammy Vasquez. Just behind Carol Ann Gould Hansen is, my father, Larry ‘Skip’ Davidson. You can only see his head a little to the left of Carol. He passed away at 49 from a brain tumor and never talked about this event. I only know what I read in a couple of old magazine articles that my grandmother had. It is interesting for me to be able to read more about what happened and to understand what he may have gone through. Thanks for this website. Would love to know if anyone remembered Sgt.Melvin Baney. He didn’t know how to swim and his body was never found, but always wondered if any survivors knew or remembered him from the flight.